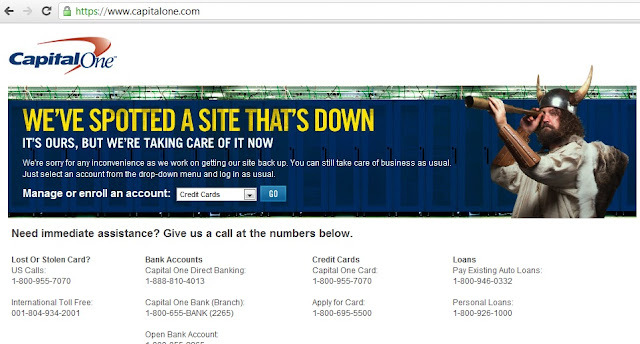 Anonymous Hackers claim to taken down the official website of CapitalOne Bank. Currently Site is showing message on Homepage that "Site under maintenance". In a pastebin release Anonymous Hacker wrote "ya know.. every guy Fawkes day companies go hire the best white hat hackers to protect them against attackers like us lol.. so dont beat your self's up if nothen was defaced or taken down by ddos.. we still doxed a bunch of people lol! congratulate your self's! Anonymous dident fail we succeeded and we will never fail.."
Hacker also claim to do DDOS attack on CapitalOne website for taken it down. There is another statement by same hacker "Many ddos attacks were taken place today and we all hoped to see at least fox going down ". Its not clear that that either the site is really under maintenance after attack by Anonymous Hackers or its any regular maintenance for backup only. Hackers also release the DOX of various people included Larry Howard Summers (formerly Director of the National Economic Council, Israel's Ministry of Defense, William Donaldson (SEC Commissioner under George W Bush) , Judge William Adams (Texas Judge who assaulted his 16 year old daughter) ,Michael Bloomberg (NYC's billionaire mayor) , Defense Technology (Oakland Police Department equipment suppliers) and More , All DOX are released in same pastebin note.